Bhutan has sent over two dozen people of Nepali origin to prison on the allegation that they were Maoists planning to launch an armed insurgency movement like in Nepal, a report said. Thirty people, said to be supporters of the Communist party of Bhutan-Marxist-Leninist-Maoist, received a nine-year sentence each, Bhutan’s official daily Kuensel reported Saturday. Two of the 30 arrested are high school students. The group is alleged to have stayed in the refugee camps in eastern Nepal, where over 100,000 Bhutanese of Nepali origin have been languishing for 17 years after being evicted by the Bhutan government, and been trained in Maoist revolutionary philosophy there. With Bhutan facing an election, the government has begun a fresh crackdown on people of Nepali origin, suspecting them of being a threat to national security. The government media says Maoists have been holding frequent secret meetings in Bhutan to trigger an anti-monarchy movement there, and have been harassing residents for food and money. Kuensel said two women from the refugee camps in Nepal went to a village in India’s Jalpaiguri town, where they gave training to over a dozen people. Bhutan’s security agencies are alleging that the exiled Bhutan Communist Party has links with Nepal’s Maoist guerrillas, who fought a decade-old war against monarchy before declaring a truce last year. It has been trying to start an armed insurrection in Bhutan again, security agencies say. The report blames an organisation, Bhutan Tiger Force, for an explosion in the capital Thimpu, alleging the BTF is close to the Maoists. The state media said that the police have confiscated Maoist literature and pamphlets from the arrested people. However, the evicted refugees who have been living in seven closed camps in eastern Nepal deny the allegations, calling it a ploy to block their repatriation. ‘These are baseless allegations intended to prevent us from returning home,’ Bhutanese refugee leader Balaram Poudel said. Poudel and other senior refugee leaders have been trying in the past to stage ‘Long Marches’ back to Bhutan, but were thwarted by the Indian police guarding the strip of Indian land they have to cross to enter Bhutan. Over 108,000 refugees have been living in Nepal’s tea garden districts of Jhapa and Morang for 17 years, hoping they would be able to return home one day. However, hopes started fading after several rounds of repatriation talks between Nepal and Bhutan failed. This year, the US offered to resettle the refugees in American cities and villages and the first resettlement is expected in January. Refugees like Poudel, who want to return to Bhutan, fear once third country resettlement starts, the lessening numbers of refugees in Nepal would ease the pressure on Bhutan to take the remaining numbers back. They also fear that if Bhutan thinks it can get away with the evictions, it will force more ethnic Nepalese to leave the kingdom. Is peoples war going to hit Bhutan from this year? Is peoples war going to hit Bhutan from this year? This is question with several answers. According to the unconfirmed reports have it that the Nepal based Communist Party of Bhutan (Marxist – Leninist – Maoist) has decided to wage an armed struggle in the Kingdom of Bhutan. Report citing a high ranking Bhutanese Maoist Leader (name withheld) was quoted as saying that the CPB-MLM was preparing for a “people’s War” in Bhutan. The CPB-MLM was formed in the year 2001 right inside the Bhutanese refugee camps in the Districts of Jhapa and Morang in Nepal. He further says In the midst of growing unhappiness among the refugees over the issue of relocating the refugees to the US, the CPB-MLM was preparing to stage a peoples’ revolt in Bhutan”. According to the refugee leader Teaknath Rijaal ” we have completed all the physically training and all the material related to people war. He further said that this war will end the autocratic monarchy from Bhutan and establish a republican Bhutan. Bhutan is one of the most backward, undevelopment and poor country among the poorest countries of south-Asia. Eventhough, it is rich enough in its geo-natural and human-resources, the nature of semi-feudalism and semi-colonialism have adversely affected its development. The very reason behind it is the monarchy, which has been controlled by the Wangchuk dynasty for the last 96 years. More than 75% illiterate, poverty striken, ill health, jobless and corrupted Bhutan’s maximum property is being divided among the Wangchuk families . The foreign aids received in the name of people and nation building activities are not only misused in the eviction process, buying cars and constructing private assets but also misused in the activities which endangers the existence of our nation as a whole. Even the Sherchops, who are next to Nepali origine Bhutanese according to population, as well as khengpas, kurtekpas, Doyas, Brokpas, Layaps, Drakpas and Uraons-mundas who are Indian origine Bhutanese, are all oppressed and exploited very badly. Educational Freedoms, Freedom of speech and publications are ruthlessly violated and all kinds of democratic and civil rights are suppressed through secret murder, imprisonment and torture, state terror and so on . The burning example for this is the Bhutanese refugee crisis. Neither the existance of human rights nor the installation of civil rights are possible without smashing the monarchy in Bhutan. In reality, it is impossible to promote any rights and justice in this situation. Hence, the true enemy of the people of Bhutan is the Wangchuk dynasty and its despotic regime which serves as the compredor of Bhutanese feudalism, Indian expansionism and the emperialism as a whole. A true and new democracy can be established only after smashing the monarchy in Bhutan. In this context, it is crystal clear that the New Democratic Revolution is the historical necessity of the hour to solve all kinds of crisis of semi-feudalist and semi-colonial Bhutan. Hence, on this auspicious occasion of the 133rd Lenin Day, with countrywide postering, pamphleting, wall-painting and hosting the proliteriat international red flag marked with sickle-hammer including Thimpu-the capital city of Bhutan, we proudly proclaim the declaration of Bhutan Communist Party (Marxist-Leninist-Maoist) to wage the new democratic revolution in the soil of Bhutan and take oath to reach the classless society via socialism by waging anti-feudalist, anti-emperialist peasant revolution through the new democratic revolution in Bhutan. Therefore, Bhutan Communist Party (MLM) requests all the Bhutanese workers, peasants, bussinessmen, employee, students, youths, teachers, writers, intellectuals and the civilians to accept its appeal and call and to help physically, morally and economically in the struggle. Bhutan Communist Party (MLM) also requests the international communities, on behalf of the oppressed Bhutanese masses, not to help the autocratic regime of Wangchuk dynasty but cxtend their support towards Bhutan Communist Party (MLM) which is fighting in the forefront struggle of democracy, civil and human rights in the democratic struggle of Bhutan. BHUTAN: Distribution of Maoist document in refugee camps: should be cause for concern. The revolutionary International Movement (RIM) and the worldwide warring communist groups, which are affiliated with the “RIM” and other revolutionary communist parties, have a leading role. In the context of Bhutan, an active communist party under a dynamic leadership, following the bright path of Marxism, Leninism and Maoism is waging the long-term peoples’ war, for the establishment of Peoples’ Democracy, if necessary. 4. Following the principle of “Land for the people”, distribute the lands to poor peasants and landless farmers. Nepal Samacharpatra daily has reported that an appeal in the name of Bhutanese Communist Party (Marxist Leninist) in circulation has an anti Indian content. Accusing the Bhutanese regime of going down the path of “Sikkimization” and selling out to India on vital issues, the Maoists have urged the people to involve themselves for a long term people’s war and that the party will adopt the strategy of taking over villages and encircling the towns. It has urged India to cooperate fruitfully in repatriating the refugees and that it is opposed to ethnic cleansing and discrimination. One of the objectives of the Party is said to be the overthrow of monarchy in Bhutan. Another Maoist insurgency is going to rock yet another country in South Asia, if the statements made by the leaders of the Communist Party of Bhutan Marxist-Leninist-Maoist (CPM MLM) are anything to go by. “Preliminary preparations for an insurgency are over. We are going to launch it soon,” says Vikalpa, nom-de-plume of CPB MLM General Secretary. 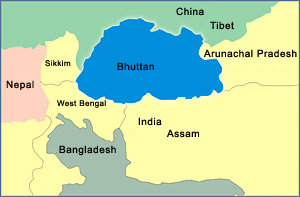 Bhutan is holding its parliamentary elections in March and April 2007. But, prior to the election date, CPB MLM plans to launch its ‘People’s War’ in the Himalayan kingdom. The goal: Abolition of monarchy and establishment of a republic. Following the footsteps of Nepali Maoists who had submitted a 40-point demand to the then Prime Minister Sher Bahadur Deuba before launching a ‘People’s War’, CPB MLM faxed a 13-point demand to the Royal Government of Bhutan on March 22, 2007. The letter stressed the need to “introduce people’s democracy in the place of absolute monarchy.” The party has asked for multi-party democracy, repatriation of the refugees to their original homes with honor and dignity, release of all political prisoners and to introduce the land reform act etc. Vikalpa (literally, alternative) says that fulfillment of the demands would have paved the way for a peaceful resolution. “But, the government, rather than taking it seriously, has unleashed terror by arresting commoners, and this has prompted us to wage an armed struggle,” says CPB supremo Vikalpa. . The Druk regime is yet to respond to these demands. The unfolding events suggest that South Asia’s only active monarchy that is ruling the so-called ‘Last Shangri-La’ is likely to take the country into Maoist violence. The eruption of militancy in northeastern South Asia will not only push Bhutan into turmoil but the two biggest Asian power i.e. India and China will have to deal with yet another insurgency in their backyards. At a time when Nepal was mired in the Maoist conflict, CPB MLM was announced on April 22, 2003. Pamphlets were widely distributed and posters were pasted in and around the seven refugee camps of Jhapa and Morang districts of Nepal. On the same day, sixteen out of a total twenty districts in Bhutan saw similar activities. That was the occasion of Lenin Day and the official announcement of the first communist party in Bhutan formed two years back. Following its formal announcement, Bhutanese Maoist leaders zeroed in on two areas: expanding the organizational network and intensifying political and military training. The Maoist cadres overwhelmingly participated in the ‘long march’ along the Mechi Bridge on the border between Nepal and India last May. The forceful attempt made by the refugees to return to their home country did not succeed. It ended with clashes between refugees and Indian security forces. The unrest triggered by the Maoists in Beldangi camp of Jhapa on 27 and 28 May led to the death of Narapati Dhungel and Purna Bahadur Tamang. The CPB MLM organized a condolence meet for the ‘martyrs’ in Beldangi and Sanischare camps on June 10. Student leaders Toya Khatiwada, Pasang Rai, Mesh Pathak, Champa Singh Rai delivered speeches during the programme. Some of the Bhutanese leaders have gone to Western countries like USA, UK, Germany, while others stay in their cozy apartments in Kathmandu, leaving their countrymen in the cramped refugee camps. In this backdrop, the Maoists have maintained a low profile while expanding the party network on a war footing. They have succeeded in drawing huge numbers of disgruntled refugees to their block. These new breed of leaders, unlike hitherto known leaders, are little known but they are spirited youths mostly from a teaching background. While the number of full time party members is still a matter of conjecture, what is obvious is that the party leadership has been rapidly expanding its network. Since the party is underground, most of its activities are undertaken through its sister organizations. All Bhutan Revolutionary Student Association, its student wing, was formed shortly after the announcement of CPB MLM. Similarly, All Bhutan Women Association was announced just two weeks after the formation of its student wing. All Bhutan Republic Youth Association, all Bhutan Teachers’ Association, All Bhutan Peasants’ Association, All Bhutan People’s Cultural Forum are other sister organizations of the party. CPB has also adopted the strategy to form independent or literary groups to spread its ideology. The now defunct Communist Study Center led by a refugee from Goldhap camp (who was adept at oratory skills) active in 2003 was one such group. CPB MLM has also been involved in collecting funds. News sources say, the party has collected donations from Bhutanese teachers working in private schools and plus-two colleges in Kathmandu. Similarly, the party has urged Bhutanese working in INGOs and donor agencies to contribute 5 per cent of their salary. Sources claim the party has been able to collect approximately 14 lakh rupees, some of which was spent on purchasing arms. Organizing cultural programmes is another way to collect money for the party. All Bhutan People’s Cultural Forum organized a cultural programme and a drama titled ‘Paristhiti Le Janmaeko Lakshya’ (Goal Created by Circumstances) at the Nepal Academy in Kathmandu on May 10, 2007. More than thirty thousand rupees was collected from the tickets of the show and from the sales of the album ‘Bidroha Ka Jhilkaharu’ (Sparks of Rebellion). The conference also elected Vikalpa General Secretary until the second national conference. “The most important decision was to make party military oriented and military party oriented,” argues Vikalpa. Bhutanese Maoists have followed the strategies adopted by Nepali Maoists. The protracted People’s War is divided into three strategic phases: defense, balance and counter attack. Defense is again divided into three sub-phases: preparation, commencement and continuation. Among these, the party is still in its first phase. The preparation phase is again divided into four phases: ideological, organizational, technical and related to struggle. Among these, they have started the propaganda machine through cultural programmes, production of people oriented musical albums and pamphlets and posters. Party mouthpieces such as Vidhyarthi Pratirodh and Naulo Awaj also serve their purpose. CPB MLM’s working area is none other than Bhutanese soil. Apart from refugee camps, Bhutanese leaders are active in Damak and Birtamode of Jhapa and Siliguri (West Bengal), Sikkim, Darjeeling and Assam in India. They also frequent Kathmandu in order to propagate and collect funds. But they are trying to focus their activities mainly inside Bhutan. CPB leaders claim that theirs is the only party established inside Bhutan. The Central Committee of CPB MLM has five commands (four commands operate in Bhutan and one in the refugee camp). More than one lakh refugees are languishing in the camps while one lakh and eighty thousand Lhotsampas (Nepali speaking Southern Bhutanese) are in Bhutan. Penetration by its cadres inside Bhutan and their mobilization has been a top Maoist priority. The result: three districts namely Tashigang, Samdrup Jonkhar and Samchi are now Maoist hotbeds. Bhutan’s geographical situation (65 percent forest and 80 percent mountainous and hill region), says CPB, is suitable for guerrilla warfare. Sources say, the party plans to stat a ‘People’s War’ from the northern districts of Yangtse, Tashigang and Mongar where the state has a minimum presence. These districts share a porous border with Arunachal state of India, which China claims as its own. The Sarchops (ethnic Bhutanese of the East) are the majority in that region. Sarchops account for 33 percent of the total population and they are coming under the influence of CPB MLM. Sarchop Mukti Morcha, a sister organization of CPB was formed a few months ago. Another organization called Gorkha Rastriya Mukti Morcha led by Amar Chhetri (which demands six southern districts be declared Gorkha Pradesh) has close ties with the Maoists. However, an analyst warns that the idea to launch the war from the southern stronghold of Lhotsamaps might be counterproductive. The Druk regime has been terrorizing south Bhutan for years. As a result, that part has become an epicentre of rebellion since the early 90s when one lakh Nepali speaking Bhutanse were forced to leave their homeland. Bhutan State Congress (est. 1952), led by DB Gurung, pioneered the rebellion in 1954 from Sarbhang district of South Bhutan. Interestingly, Prime Minister Girija Prasad Koirala had also taken part in the democratic movement in Bhutan in the early 1950s. He disclosed the fact in his memoir published in Nepal Weekly Magazine (Aug 20-26, 2007). CPB MLM invokes Mahashur Chhetri, killed in 1954 uprising, as an inspiration for their cause. If CPN Maoist enters mainstream politics shunning violence, they might only share ideological grounds. Nevertheless, if the Constituent Assembly polls did not take place and they adopted a policy of rebellion, relations between these parties might extend to the level of material cooperation. CPB also maintains close ties with the Communist Party of India Maoist. The main reasons behind the formation of CPB are the frustration and anger due to the protracted refugee crisis. But will politics of violence be successful? A Bhutanese human rights leader has a few caveats. He says it is problematic for an underground party to wage a war in Bhutan due to the small size and the sparse population of the country. He recollects the arrest of 39 Bhutanese following a cultural programme4 organized by Maoists in May. Maoist leader Gaurav says, “It’s easy to start an armed struggle in Bhutan because the government is very weak. But, it may have to face the military strength of India.” Bhutan, surrounded by Indian states fighting an insurgency for decades, is a strategically important region. “That’s why,” he says, “India will try to prevent a ‘People’s War. '” Like Nepal, it is sandwiched between China and India. CPB has a nexus with ULFA and Bodo, separatist outfits operating in northeast India. When Nepal’s Maoist conflict reached its apogee, India termed it a common security threat for both countries. If such a Maoist conflict spawns in Bhutan, it will definitely be a trilateral (Bhutan, Nepal and India) issue. “Bhutanese Maoists have to directly confront Indian security forces,” says Ram Karki, central member of CPN M.
Indian interest in Bhutan is manifold. However, bilateral treaties bind Bhutan with its southern neighbour. According to the India-Bhutan Friendship Treaty of 1949, India has the prerogative over the issues of foreign affairs and security of Bhutan. The treaty was amended in February this year. Firstly, Article 2 has been rephrased and the term ‘guided by the advice by GOI’ has been replaced by ‘friendly cooperation’ in the context of Bhutan’s foreign relations. Secondly, Article 6 has been revised to the extent that Bhutan can act independently in importing non-lethal equipment, but will still have to go by India’s assistance and approval for import of arms, ammunition, machines and warlike materials and stores for Bhutan’s welfare and protection. Though, there seems to be some changes in theory, India still plays in practice a significant role in the security and foreign relations of the Druk regime. India’s special relation with Bhutan has irked Bhutanese refugee leaders. Bhutanese leader Teknath Rizal says, “Aren’t the issues raised in Terai and ours the same? Why does India keep mum over our issue?” India’s diplomatic reticence is obvious given its involvement in hydropower projects and military training in Bhutan. India has established a Military Training Team (IMTRAT) in Ha district of Bhutan. The Indian army is also active in Bhutan under the name of the General Road Task Force. In early 2003, the Royal Bhutan Army with assistance from the Indian army flushed out the insurgents operating in northeastern India from their base in southern Bhutan. The separatist outfits, United Liberation Front of Assam, National Democratic Front of Bodoland and Kamatapur Liberation Organization, once welcomed by the royal government, were later perceived as threats to the state. But three years after getting rid of the Indian insurgents, the government is likely to confront homegrown militants. This confrontation can largely be traced to the refugee problem created by Bhutan itself almost two decades ago. In this scenario enters the United States with a proposal to resettle sixty thousand refugees. This proposal, sources say, surfaced after the US detected growing extremism in the refugee camps. Australia and Canada have also shown willingness to take in a few thousand refugees. In the same release, the party has vowed to start an armed struggle. It remains to be seen whether CPB MLM will be confined to mere press releases or carry out yet another ‘People’s War’ in the subcontinent. Latest yet unconfirmed reports have it that the Communist Party of Bhutan (Marxist-Leninist-Maoist) has decided to wage an armed struggle ”People’s War” in the Kingdom of Bhutan. Report citing a high ranking Bhutanese Maoist Leader (name withheld) was quoted as saying that the CPB-MLM was preparing for a “people’s War” in Bhutan. The CPB-MLM was formed in the year 2001 right inside the Bhutanese refugee camps in the Districts of Jhapa and Morang in Nepal. “In the midst of growing unhappiness among the refugees over the issue of relocating the refugees to the US, the CPB was preparing to stage a peoples’ revolt in Bhutan”, he added. “The revolt will be commenced prior to the general elections in Bhutan”: and added further that “the CPB (MLM) garners comfortable support for the revolution in 16 districts of total 21 districts in Bhutan”.